The floor of Lus Chasma. Credit: NASA/JPL-Caltech/Univ. of Arizona . One of the most important questions about other planets is whether water is present in any significant amount. Water sustains Earth’s ecology, so there is a presumption among planetary scientists that water is necessary for life to exist on other planets. There are rovers on Mars, along with satellite imagers, looking for evidence that water exists, or once existed in the past. The minerals jarosite and opal, spotted from space in Ius Chasma, only form in water, so the speculation is that they formed in the same way that they form on Earth. It is thought that sulfur became trapped in ancient glacier ice and created the acidic sulfate minerals. It is generally believed that Mars is covered with a global layer of permafrost because the annual mean temperature of the soil is approximately – 50 Celsius. It is far colder in the northern and southern latitudes – so cold that carbon dioxide gas freezes into a solid and blankets the terrain with dry ice. Therefore, say planetary scientists, any water “must be” bound up with thick icy soils or locked in frigid underground vaults, because the atmosphere is thin enough for water-ice to sublime directly into vapor and vanish. Since ice rather than liquid water is thought to predominate, it “must have been” Martian glaciers rather than Martian floods that excavated the anomalous terrain. The Viking mission orbiter hinted at some large geological structures that looked like they might be of periglacial origin. The resolution of the Viking cameras was too low for any specific details to be analyzed, however. On Earth, glaciers are theorized to create characteristic varves, moraines and loess. Each type of deposit seems to require that mountains of ice, acting like slow-motion bulldozers, push enormous mounds of soil and rock ahead of their billion-ton flanks. In so doing, the gravel and sand is supposed to be sorted by the glacial movement and piled-up into distinctive formations. The question is, what else besides glaciers acts with compressive force, sorting material into cohesive layers? 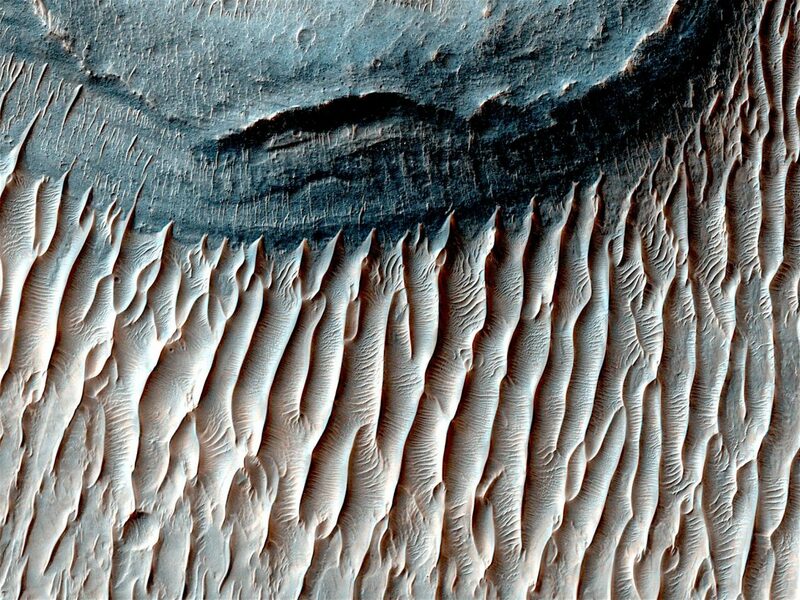 On Mars, other factors must be included: the formations are often blackened and morphed into “dunes” with deep channels etched into their slopes. In an Electric Universe, powerful electric arcs are responsible for the majority of Martian surface features. The energy released by plasma discharges carved sinuous rilles, flat-floored craters, “railroad track” patterns in canyons and craters, intersecting gullies with no debris inside them, giant mesas with Lichtenberg “whiskers” and steep-sided ravines wending through landscapes dotted with circular uplifts. If what is seen on Mars took place in the presence of planetary lightning bolts and was not the result of ice or water moving across the surface, should ideas about similar observations here on Earth be reconsidered?